Gorgeous Fairy poised on tiptoe to take off with her wand to spread her good magic around. She is dressed in a very short pretty tunic and she has three sets of wings. Her wand has a faceted round Rainbow Swarovski Crystal at the tip. She is tiptoeing on a fairy mound with little flowers that have jeweled Crystal and Ruby centers. This delightful piece boasts 49 faceted Swarovski Crystals in Sapphire, Emerald, Alexandrite, Topaz and Amethyst colors. The fairy herself has delicate butterfly wings adorned with 14 Topaz and Sapphire crystals. The three Butterflies have from 8 to 14 crystals each encrusted in their wings. Delicate leaf clad Fairy scattering sparkling blue fairy dust around her. She has 17 faceted Swarovski crystals in Aurora Borealis, Peridot, Topaz & Crystal colors. Her wings have 8 Crystals including 2 large Peridot crystals. The dazzling blue glitter makes her an eye catcher, everyone will notice this beauty!! 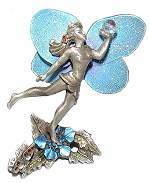 Stunning jeweled winged Fairy kneels, as she holds a basket decorated with garlands of Ruby crystal petal flowers that has a whopping Swarovski faceted Aurora Borealis v-shaped crystal. Her wings have dazzling Emerald and Peridot crystals which make this a big eye catcher!! Adorable winged Fairy sits beside an enchanted mirrored pond, while the Mouse King tests the waters. Lovely faceted Swarovski Crystals in Aqua, Clear and Aurora Borealis encrust her wings, garland flowers and the Mouse King's Eyes. A larger faceted AB orb adds majesty to his crown. An enchanting tray to lay your trinkets on. Dainty Mushroom Fairy rests on one of her stools! She has a double set of butterfly wings and a very pretty smiling face. There are four Swarovski faceted crystals in Emerald (2), Ruby and Crystal color in the head of the mushroom , around her feet. This is a charming little piece. 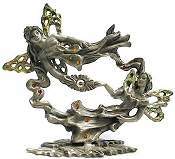 Two bejeweled and glittery winged Fairies share a crystal starburst atop a leafy base, connected by flowing "ribbons". Multicolored glitter adorn their wings front and back, while Swarovski Crystals in Ruby, Citrine and Aurora Borealis grace the leafy base , ribbons and the fairies themselves. One large crystal centers the starburst between them. A lovely serene Angel with Crystal Orb is standing on a jeweled cloud. This breathtaking angel has 18 faceted Swarovski Crystals in Aquamarine and Crystal colors to simulate the skies, as well as a faceted Rainbow Orb which she holds and a round Crystal Halo. The detail on her large wings is stunning. People will constantly pick her up to take a closer look. Ambrosia has gossamer glitter wings in blue with a charming lavender center. She stands on a blue petaled flower with an exquisite jeweled butterfly at her feet. The butterfly has 5 Ruby and 2 Aurora Borealis faceted Swarovski Crystals on each wing. She comes gift boxed with a charming Legend Card.